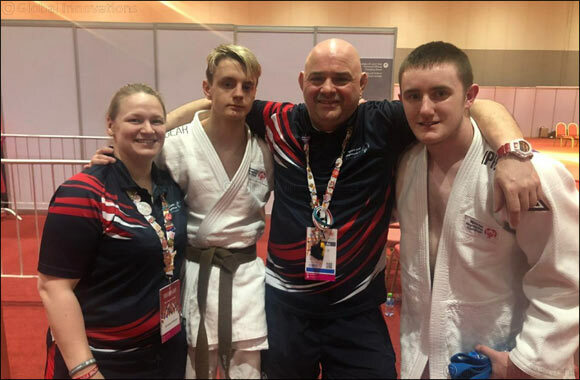 Dubai, UAE 19 March 2019: There’ll be plenty of smiles in the Henaghan household when Team Great Britain Special Olympics judo athletes Daniel and Denise bring their medals home. Daniel and his younger sister, Denise, won gold and bronze respectively in their judo division competition held at the Abu Dhabi National Exhibition Center (ADNEC). Sixteen-year-old Denise was awarded her medal on the first day of the judo competition, with older brother Daniel, 17, winning his on day four of Special Olympics World Games Abu Dhabi 2019. “Being here in Abu Dhabi has been such a positive experience and such a great culture shock,” said Daniel, 17, who lives in Newcastle in the north east of England. Team GB judo athlete Philip Brodie was also among the medals, taking bronze in his division competition at ADNEC. The 18-year-old, from Livingston in Scotland, was competing in his first World Games and said he was happy to be taking home a medal after tough matches against athletes from Mongolia and Russia. “It’s nice to have a medal,” said Philip, who added he’s looking forward to heading home and focusing on his next competition. Johnny Imrie, who coaches the Team GB Judo athletes with his daughter Emma, said the whole team had performed well in Abu Dhabi.